Tralance Addy ’69 Brings Potable Water to Developing Countries. In 2001, Addy—wanting to do more of “what was emotionally important” to him—founded Plebys International with the mission to bring business and technology together to address the needs of developing countries. At that time, an estimated five million people died annually from water-borne diseases. 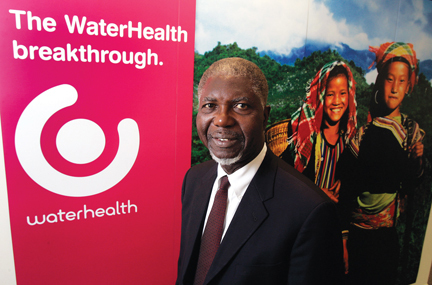 WaterHealth International (WHI), a tech startup, was the first company Plebys acquired. As CEO from 2002 until 2009—and with WHI holding the proprietary rights to UV Waterworks, an ultraviolet water purification system—Addy revamped the company’s business model from selling a device to selling a service and developed an integrated process for a decentralized approach that would essentially allow water “micro-utilities called WaterHealth Centres to be operated sustainably through modest and affordable user fees on a community by community basis. He also partnered with NGOs to educate villagers about the importance of clean water and built a network of local professionals to service and maintain the equipment, allowing locally hired and trained residents to operate their own water systems under the management of WHI. The heart of the water purification process is a 60-watt ultraviolet lamp. The water is filtered through a series of stages before entering a disinfection chamber where the ultraviolet lamp administers a lethal dose of ultraviolet light to destroy remaining bacteria and viruses that cause a range of diseases including polio, diarrhea, and cholera. The disinfection process is 6,000 times more energy efficient than boiling water. Installation of the decentralized water system in a community can be less than $10 per person depend- ing on a number of factors, and user fees are within reach of even households that earn less than two to four dollars a day. Because low population density makes a centralized water-treatment facility impractical, the WaterHealth Centre micro-utilities are set up in villages and other small population areas. In some cities such as Metro Manila in the Philippines, residents can purchase five-gallon containers of purified water at franchised water stores. Doing well by doing good is Addy’s goal—to build companies that can help millions rather than small numbers of people here and there, while still making a profit. “Initiatives such as the provision of clean water to the underserved helps drive economic development as well as improve health, allowing the people who are not well off to be more productive and enhance their chances for improving their lives,” Addy says. Addy, who came to Swarthmore through the African Scholarship Program of American Universities, says it was uncanny that the program matched him with a College so focused on service. 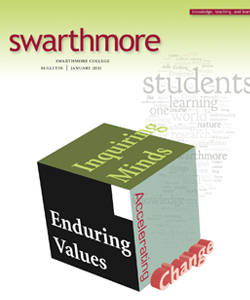 “I didn’t realize it at the time,” he says, “but I left Swarthmore with even more determination to make a difference.” Addy also left his mark on the College by being the first student to earn two degrees—a B.A. in chemistry and a B.S. in mechanical engineering—at the same time. Initially, the water purification technology was tested in Mexico and the Philippines. Now, WaterHealth Centres have been set up in hundreds of locations, primarily in India, West Africa, and the Philippines, providing access to clean water for more than 1.5 million people. There are also a number of systems providing clean water in Sri Lanka and Mexico. Learn more about Water Health International.